In the light of current economic problems, and in particular economic growth, Yueh explores the thoughts of economists from Adam Smith and David Ricardo through Joan Robinson and Milton Friedman to Douglass North and Robert Solow. Along the way she asks, for example: what do the ideas of Karl Marx tell us about the likely future for the Chinese economy? How does the work of John Maynard Keynes, who argued for government spending to create full employment, help us think about state investment? And with globalisation in trouble, what can we learn about handling Brexit and Trumpism? In one accessible volume, this expert new voice provides an overarching guide to the biggest questions of our time. 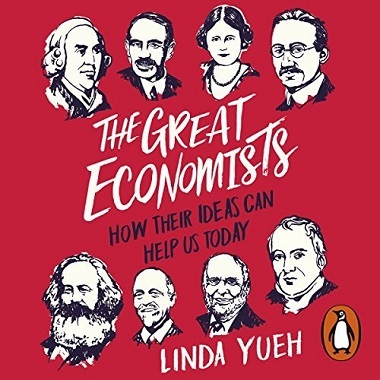 The Great Economists includes: Adam Smith, David Ricardo, Karl Marx, Alfred Marshall, Irving Fisher, John Maynard Keynes, Joseph Schumpeter, Friedrich Hayek, Joan Robinson, Milton Friedman, Douglass North and Robert Solow.